magicana: sharing wonder | We are dedicated to the study, exploration and advancement of magic as a performing art. Can there really be an untold story of the great Harry Houdini? Believe it or not … yes. But, does MacNab really reveal all? What skeletons, if any, does he unearth as he peers into the past of these struggling artists? Can there really be that much more on Houdini after hundreds of biographies? Track down your copy of the Literary Review of Canada and find out what Ben has to say about MacNab’s first stab at magic history, story telling and ghost chasing the great Harry Houdini. C. Dennis Shick’s article, “The Benevolence of Magic” – in the December 2012 issue of The Linking Ring (Vol. 92, No. 12) – talks about the altruistic capabilities of the magic community. Some notable organizations include the College of Magic in Capetown, South Africa where the school has developed a 6 year on-campus program that aims to teach students all aspects of magic. It is refreshing to see the vast number of initiatives from around the world that aspire to help their community through the art of magic – a driving force behind our own arts organization, Magicana. My Magic Hands uses the art of magic as a teaching vehicle to reach children in communities and help them build self-confidence and teach essential life skills such as communication, critical thinking and problem solving. We do this through a carefully constructed 8 week program that ends in a Big Show, where participants invite their families and friends to showcase what they have learned throughout the course. The show motivates our young participants to practise and perform at their very best, which in turn raises and bolsters their self-confidence and self-esteem. It becomes about what is possible. My Magic Hands first started by focusing on children from the ages of 8 to 14. However, it has evolved to include even younger participants and in special programs, young adults 16 to 18 years old. For example, during last year’s special summer session called Helping Hands, Julie Eng, along with Holland Bloorview’s occupational therapists, led a modified constraint induced movement therapy (CIMT) for clients with hemiplegia (paralysis on one side of the body) secondary to an acquired brain injury. Select activities, such as basic sleight-of-hand technique, were given to promote the functional use of their hemiplegic arm and hand – with amazing results. Senior Sorcery is Magicana’s community initiative to reach isolated seniors in the Greater Toronto Area by bringing live, theatrical magic shows to retirement residences and community centres. c) Dynamic Duo: a combination of both show types. In 2008, Magicana created the Tony Eng Youth Fund program in memory of Tony Eng (1946 – 2008). Its main goal and purpose is to promote and support youths as they pursue the art of magic. Although the program started by providing bursaries to aspiring, young magicians to help them attend the CAM (Canadian Association of Magicians) convention, it has since evolved to include other conventions and lectures, such as Magi-Fest 2013, to provide opportunities for valuable mentor relationships; and, to inspire, motivate and support youth in magic. We are very proud of these community initiatives and applaud all the other programs that were mentioned in The Linking Ring as part of “The Benevolence of Magic” article. Thank you to The Linking Ring for sharing all of our work and for showcasing the power of possibility through the art of magic. The new gallery can be found in “American Variations” category, under the heading: “The Miracle Factory“. It exhibits some photos of the limited edition scroll (only 50 copies made) of The Erdnase Scroll, a forty-foot long ivory, parchment paper scroll. It also has hand-tinted frontispiece in watercolor and India ink, adorned with maple-toned wood ornaments, tied with a suede cord, encased in an evergreen embroidered velour pouch with gold cord and tassels. The entire text is in a beautiful handwritten calligraphy font and is remains readable as a learning tool. It is certainly a beautiful piece and is a must have for all Erdnase enthusiasts around. If you are interested in obtaining, contact The Miracle Factory. Don’t forget to sign our guestbook to let us know what you think! Congratulations to Walrus Magazine for their interesting speaking series: The Walrus Talks. Last night, they presented The Walrus Talks: Performance, inviting a broad range of Canadian talent to give their insights and thought-provoking ideas on performance. From branding to innovation to productivity to Olympic skill, each speaker shared their perspective on what it takes to “perform”. David Ben, Magicana’s artistic director, is known to incorporate the art of magic into creativity and problem-solving. At the High Performance Rodeo in Calgary on Jan 29 , he shared his ideas about performance – not from the stage but from the dark and mysterious world of gamblers card cheats. Specifically, David talked about one area of card table artifice that has plagued the best of card cheats for centuries. Not only did he flag the problem (while entertaining the audience with a sly nod to his sleight-of-hand wizardry), he also shared how he solved this “tricky” manoeuvre by tipping his famous mantra: “How do you get in to it, and how do you get out of it”. David is often quoted as saying, “Magic is the cumulative effect of hundreds of apparently inconsequential details”, and he deftly demonstrated this sentiment as he showed the 1,200 member audience exactly how he solved the mysterious magic move – all in just seven minutes. “His presentation comes with a bonus instructional video on how to do some card tricks. Mind blowing.” — Jaelyn Molyneux, “Overheard at The Walrus Talks” on Culturesnack. Read more from #thewalrustalks on What Was Overheard at the Walrus Talks. Congratulations to all the speakers. Clearly, it was a very successful event and we look forward to following future Walrus Talks! Congratulations to Joshua Jay and Andi Gladwin for staging and producing a successful 83rd MagicFest! From all accounts, it sounds like there was a full house filled with stellar speakers and performances, heaps of magic dealers and of course, magic day and night. What more could any magic enthusiast wish for?! We also congratulate our Tong Eng Youth Fund Bursary Recipients – part of the Magi-Fest Youth Scholarship program. Their verdict of the convention? “It was fantastic! I learn(ed) a lot from people like: Ralpho, Eric Jones, Bennet, Christian Schenk, Tony Chang and Danny DaOrtiz. I became friends with Tony, Greg Lewis, Ivan Bekcic, Ralpho, and Eric Jones. I also gave (…) a bunch of advice at the beginning of the trip, which made me feel great inside. We are so pleased that our winners had a memorable time and we hope this experience helps you along your journey into the world of magic, and that we see you in many more conventions to come! Before we dispersed for the holidays, we had our first My Magic Hands workshop at SickKids with the adolescent medicine program. The mission of SickKids is, “to inspire our communities to invest in health and scientific advances to improve the lives of children and their families in Canada and around the world”. Using our My Magic Hands program, we hope we successfully used magic as a teaching vehicle to improve the quality of life of young adults by building up their self-confidence and public speaking skills. We received positive feedback from both the participants and their coaches/supervisors and look forward to future outings together in 2013. We are delighted to announce that David Ben is presenting a unique speech for the The Walrus Talks Performance on Tuesday, January 29, 2013, 7:30 PM, at the Jack Singer Concert Hall in Calgary, Alberta. 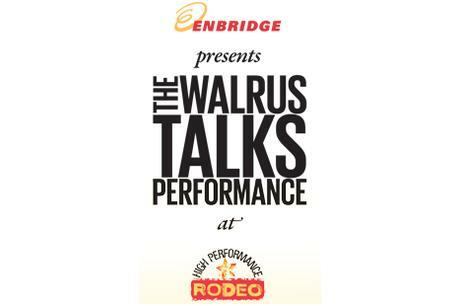 The Walrus Talks Performance at High Performance Rodeo promises eighty minutes of lively, thought-provoking presentations from eight diverse individuals including our Artistic Director, David Ben. Speakers will share their perspectives on how one performs, how one competes and how one grows. David, who is a sought-after keynote speaker on creativity and problem-sovling, has chosen to inspire the audience with his interesting take on card cheating. Don’t miss this evening of engaging dialogue, as some of the country’s greatest minds explore the topic of performance! For tickets, visit hprodeo.ca or call (403) 294-9494.